Himalayan climber Katja Staartjes: “Are you looking for a speaker who really motivates your people to get the best out of themselves, and to grow? My speeches inspire and stimulate personal leadership. My story is based on my intense experiences as a Himalayan mountaineer and I combine this with my personal background in senior management roles. That is why I can easily make the translation to your situation and help you to further develop your organisation. Whether it’s about the top of Mount Everest or a top performance, motivation is key to achieving an end goal. If you have joined objective, really go for it and cooperate well, almost anything is possible. 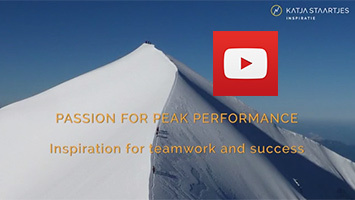 This applies to both mountaineering and challenges within your organisation. My experiences in the Himalayas form a powerful metaphor to inspire your people to get the best out of themselves. However, you need to be able to take an honest look at yourself. And know yourself. In short, you go further together with personal leadership. And this helps you to achieve the intended results. I use breath taking images from my expeditions to peaks such as Mount Everest (8848 m) and other mountain giants in Nepal and Pakistan to strengthen my story. This visual support ensures that the messages actually have impact and make a lasting impression. This gives your team the chance to really apply my story in their daily lives. If you would you like a powerfull presentation please complete the form or call Katja Staartjes (The Netherlands) at +31 6 212 742 82.